VAS is the most technologically advanced vibration analysis platform on the market today. Based on a fully digital analysis logic, they offer both high sensitivity and resilience to false alarms. Multi-channel models are the first on the market that can configure and monitor each passive vibration sensor independently from the others. Each sensor can therefore be configured with sensitivity parameters that are optimised for each specific installation case (wood windows, PVC or metal windows, doors, walls, etc. ), and that can be matched against the unique security requirements of every single scenario. At the same time, each channel provides an individual output signal to the control panel, allowing operators to quickly isolate the source of each alarm. If necessary, each input channel can also accept multiple sensors connected in series, allowing the system to scale up even further. This enables the deployment of complex, large systems with a reduced number of boards, and with the possibility to divide the monitored zone in multiple, independent groups. Even though they are based on complex technology, VAS boards are easy to install and quick to configure and maintain, thanks to the exclusive wireless configuration system WSyncTM. With a smartphone or a tablet and the dedicated TSEC App, available for both Android and iOS*, professionals will discover a new, liberating way of managing Vibration Analysis System boards: with just the tip of their fingers. 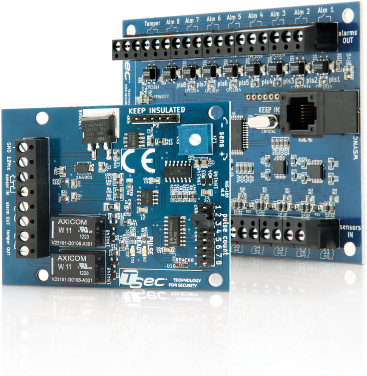 VAS-800 and VAS-800 multi-channel boards enable fine-grained per- sensor analysis in large and complex installations. Three models, from single in/ single out, to 8 in/8 out, with fully independent channels in terms of configuration and maintenance. Besides being individually quality checked, VAS boards are subject to the most rigorous laboratory tests, and meet or exceed all applicable EMC norms. 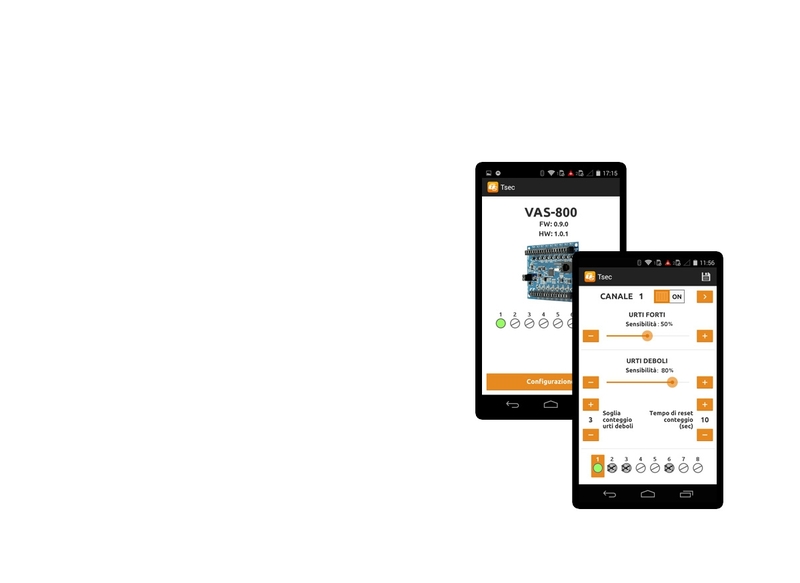 VAS boards offer a much simplified installation and configuration procedure, thanks to the exclusive WSync wireless system, available for both smartphones and tablets. 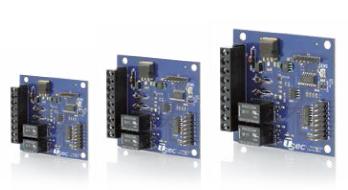 Engineered for bringing out the best from CLIC V-series magnetic vibration sensors, VAS boards are also compatible with all passive vibration sensors on the market. VAS-100 is a microcontroller-based analysis board for passive vibration/shock detectors. Although it has been specifically designed for CLIC V-series sensors, it offers full compatibility with any passive, normally closed vibration detectors on the market. 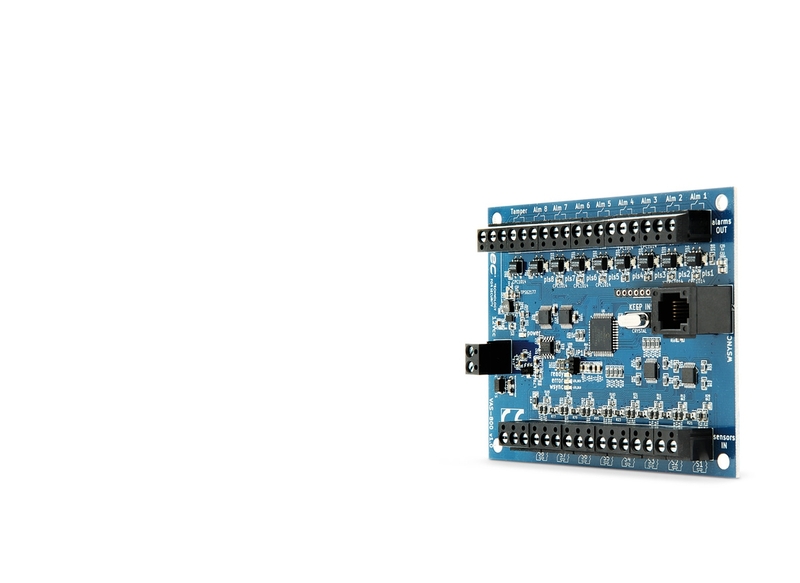 It accepts multiple sensors connected in series to its input, up to a maximum of 10 units. 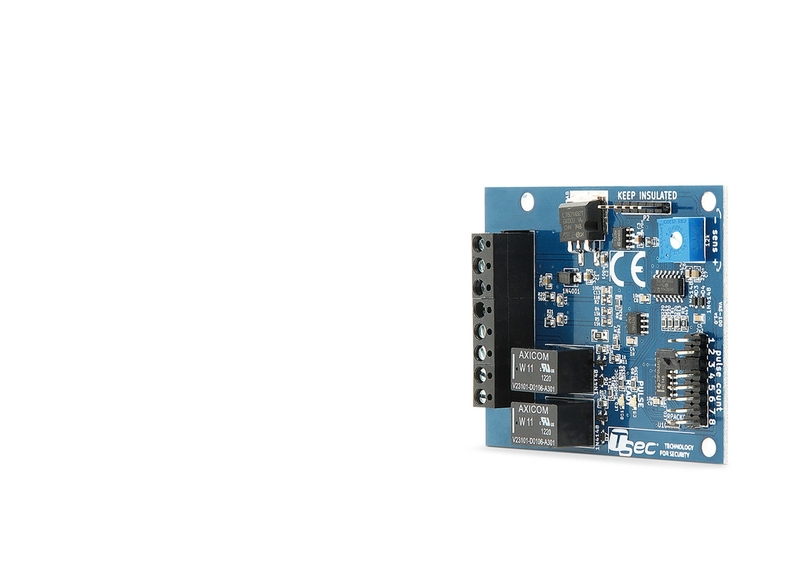 It offers two independent outputs, each driven by an electromechanical relay. The first output gets open for 2 seconds in case of alarm. The second one gets open in case a tamper condition is detected on the input, such as open circuit or magnetic tampering on CLIC V-series sensors. VAS-400 and VAS-800 are analysis boards for passive vibration/shock detectors, with 4 independent channels (VAS-400 models) or 8 independent channels (VAS-800 models). Although they have been specifically designed for CLIC V-series sensors, they offer full compatibility with any passive, normally closed vibration detector on the market. 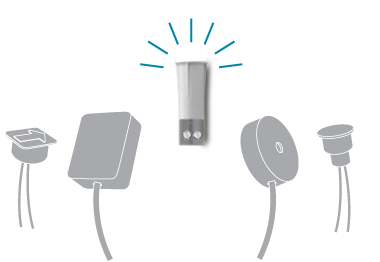 Each port accepts a single sensor or a series of up to five sensors. Each detector can be installed with or without EOL resistors. In the latter case, the board automatically detects its value, from 2.2 kOhm to 11 kOhm. Each channel has an independent alarm output port. One tamper output port is shared by all channels. Each alarm output gets open for 2 seconds when configuration thresholds are exceeded by the corresponding detector. The tamper output gets open for 2 seconds when one of the following conditions applies to one of the input detectors: open circuit, magnetic tampering on CLIC V-series sensors, short circuit, variation in EOL resistor value (only for detectors with EOL resistors). Tamper events are also signalled by the blinking of the output LED that corresponds to the input port that generated it, which simplifies maintenance operations. The board analyses impulses from each detector according to four configuration parameters, which are set independently for each channel: the strong shock threshold (1-20msec), the weak shock threshold (350μsec-1msec), the number of weak shocks necessary to trigger an alarm (1-8), and the reset time of the weak shock counter. 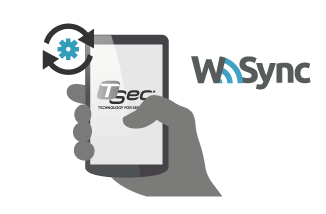 WSync allows wireless configuration and maintenance of VAS boards with the tip of your fingers, using either a tablet or a smartphone with Bluetooth and the free TSec App. By allowing the tuning of the configuration parameters directly where each vibration detector is installed, as opposed to where the analysis board is located, installation time and costs can be dramatically reduced, at the same time enhancing the quality and security of the system. 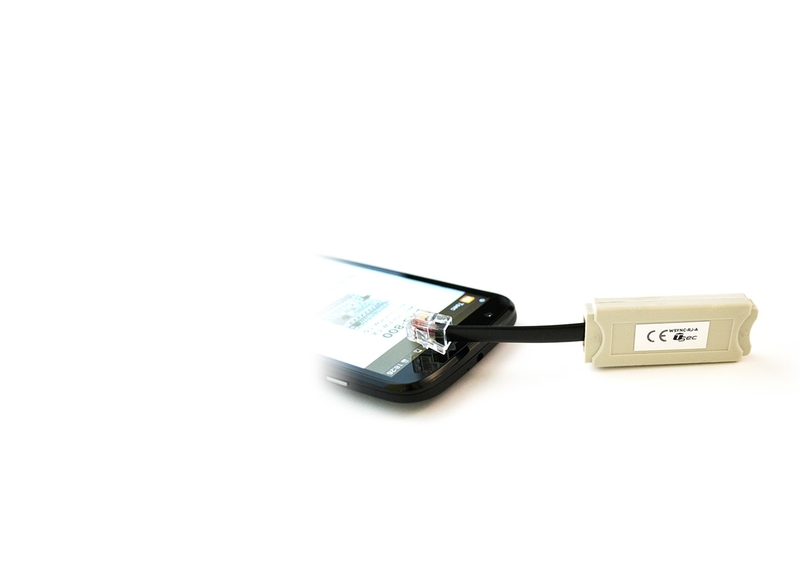 WSync is based on a proprietary accessory dongle that enables wireless operation of VAS boards. The dongle has been engineered so that it is used only during the initial or periodic configuration (maintenance) of the boards. In other words, it becomes one of the tools of the trade for security professionals. WSync uses Bluetooth as a transmission means, and it has an indoor range of up to 15 meters. Whether you are an avid smartphone user, or you prefer a PC for configuring and maintaining security devices, TSEC has got your back. reduce installation and maintenance times. With modern, streamlined and responsive user interfaces, configuring a security device has never been so simple. The suite is completed by software for PC, for environments where smartphones are not available.